This is part 3 in a series on getting started with Silverlight. To view the index to the series click here. You can download the completed project files for this sample application in C# or Visual Basic. Now that we have our initial layout outlined and some controls to work with, let’s start getting the data. 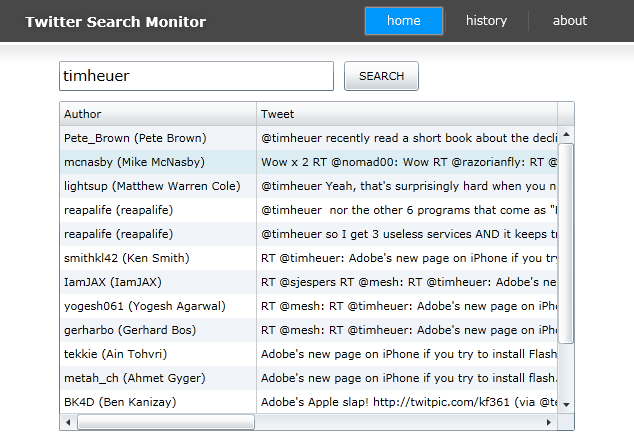 Since we’re going to use Twitter search, we’ll be leveraging their web service API. In our application we won’t be hosting our own database or anything but I did want to point out the various ways you can access data via Silverlight before we go to work on ours. One of the bigger beginner misconceptions about accessing data in Silverlight is people looking for some ADO.NET class library in Silverlight. Stop looking, it isn’t there. Remember, Silverlight is a client technology that is deployed over the Internet. You wouldn’t want a browser plug-in to have direct access to your database…as you’d have to expose your database directly to the web. We all know that is generally a big no-no. File: accessing static content via web requests. Working with Sockets requires you to really understand your deployment scenario first before you jump right in and think this will be the best method. Silverlight can communicate with local data or data on the web. For local data access, the application does not have direct access to the file system, but rather can read/write data via user-initiated actions using the OpenFileDialog and SaveFileDialog APIs to request and save streams of data to the local user’s machine. You may find yourselves using these techniques to save settings-based data or use very simple data access. This is the heart of accessing data in Silverlight – through a service layer. Silverlight supports accessing standard ASP.NET web services (ASMX) or WCF-based services using the familiar Add Service Reference methods in Visual Studio that will generate strongly-typed proxy code for you. The third point there, .NET RIA Services, is a new framework that aims to make accessing data simpler and more familiar. The link to the video will walk you through an introduction of that topic. RIA Services is best when you own the database and are hosting services in the same web application that will be serving up the Silverlight application. Notice that you use the result of the service call in a completed event handler. This is the pattern that you will see over and over again with basic service access. In our Twitter application, we actually will be accessing a service hosted elsewhere and will need to conform to these policies. Luckily, the search API for Twitter enables this access through their cross-domain policy file (http://search.twitter.com/crossdomain.xml). The other areas of Twitter do NOT, which is why, for now, you would not be able to access them directly through Silverlight. In this situation you would proxy those service calls through your own service that you could enable cross-domain access via a policy file for Silverlight. Confusing? It’s simpler than it sounds. COMMON MYTH: You need the Silverlight and the Adobe cross-domain policy files in your service to enable access. This is NOT TRUE and I see it to often people saying I have crossdomain.xml and clientaccesspolicy.xml and it still doesn’t work. If you are building a service for Silverlight consumption via cross-domain, you only need the clientaccesspolicy.xml file format – that is what we look for first and is the most flexible and secure for Silverlight. Now that we have a high-level overview, let’s start accessing our data! The Twitter search API is a simple REST-based API that we’ll only really be calling GET requests on in our application. The format they provide is the Atom specification which makes our job a lot easier because it is a standard format and Silverlight has framework libraries that support direct consumption of that format. With our model in place we can shape the result and do some data binding. There are two other network APIs we could have used to access the Twitter API: HttpWebRequest and ClientHttp. HttpWebRequest is essentially what we *are* using with WebClient as it is a simple wrapper around that API. If you needed more granular control over the headers in the request, you’d want to use HttpWebRequest. Both WebClient and HttpWebRequest make use of the browser’s networking stack. This presents some limitations, namely not being able to receive all complete status codes or leverage some expanded verbs (PUT/DELETE). Silverlight has also introduced a ClientHttp option and uses a custom networking stack that enables you to use more verbs as well as receive status code results beyond 200/404. Note that we *are not* using this method, but just wanted to point these out for you. The call to RegisterPrefix denotes that we registered it to use the ClientHttp networking stack instead of the browser’s networking stack. In the above sample we registered only calls to the Twitter search domain, but we could have enabled it for all HTTP requests as well. These are additional options for you to consider in your applications. Because our application is going to ‘monitor’ search terms in Twitter, we want to really just set up binding to an object collection once, and then just manipulate that collection (in our case, add to it). To do this we are going to use two helpful objects in Silverlight: ObservableCollection<T> and PagedCollectionView. ObservableCollection is a collection type that automatically provides notifications when items are modified within the collection (added, removed, changed). PagedCollectionView will be used to help us automatically give some sorting to our objects. Notice that in the loaded handler we set the ItemsSource property of our DataGrid (SearchResults) to be the PagedCollectionView that is sorted (see the SortDescription we added in line 6 above). Now our UI is bound to this PagedCollectionView…so we should probably populate it. Remember that it is actually a view of the data in our ObservableCollection<TwitterSearchResult> – so that is what we need to add items to in order for some data to be seen. A few things are happening here. First, the e.Result matches the Stream of response we’ll get from a successfull search. If an error occurs, we’ll use the ErrorWindow template which is provided for us in the navigation application template we chose. The _gotLatest member variable helps us track the whether or not we need to reset the max value (which is so future queries request only the latest since the previous query). After we get the stream we load it into an XmlReader for ease of parsing with our SyndicationFeed class. SyndicationFeed is a class in the System.ServiceModel.Syndication library that you’ll have to add a reference too in your project. It has built-in functions for parsing known syndication formats, like RSS and Atom. NOTE (Here be dragons): System.ServiceMode.Syndication brings with it other dependency assemblies. It is not a small library, but convenient to have. Take caution in using it for your project and know when and why you need it. We are using it here so you can be aware of the features and productivity benefits. An alternative method (especially for just reading syndicated feeds) would be to actually just use LINQ to XML and query the resulting XDocument after loading it. Again, for demonstration purposes, I wanted to point out the productivity use of SyndicationFeed as a strongly-typed class available to you. Once we have the SyndicationFeed data loaded, we simply iterate through it and add a new TwitterSearchResult to our ObservableCollection<TwitterSearchResult> object. You’ll notice we’re doing some conversion on the Image URI to an ImageSource for easier binding later. Additionally, we’re parsing out the ID of the tweet so we can set the first result (which is the latest) as the most recent ID for later querying (_lastId). In our final step here, we want to make sure we are giving some feedback to our users that we are doing something (searching). Luckily we have something easy for you in an ActivityControl. At the time of this writing, the ActivityControl was a part of the .NET RIA Services templates, but you can get it here on David Poll’s blog. You’ll have to build the control and then add a reference to it in your project (if you download the source to our projects the binary is already included in the Libraries folder for you). UPDATE NOTE: While the contents of this tutorial remains unchanged, the ActivityControl is now called the BusyIndicator and is released as a part of the Silverlight Toolkit. Following the same techniques you can get the official control from the toolkit and have it deployed with your application. No more need to compile on your own. 61:         // Executes when the user navigates to this page. 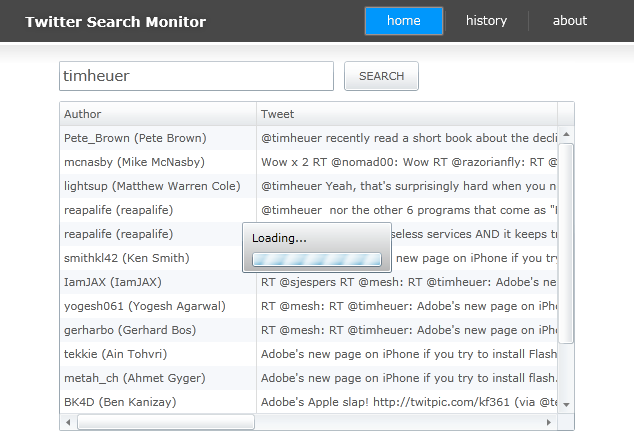 The flow will be that our Search page will load, start the timer and start the initial search. After the interval time fires, the search will be executed again, but remember it will use the last known ID to start from as not to load all the repeats again. This future search data will be added to our ObservableCollection and since the DataGrid is already bound to that, it will be automatically represented in the UI in the appropriate sort order. We also added some checking to make sure the search term is there and we’re not searching for a blank value. At this point of step 3 we’ve made a lot of progress. We’ve wired up a service call to a 3rd party service, hooked it up to a DataGrid using binding, and added a timer to automatically fetch the service. We could be done, but we’re not – the DataGrid isn’t exactly how we want to represent the final UI, Let’s move on to part 4 where we actually do some data templating and introduce you to the XAML binding syntax.